Looking for a ride? We've got one for you regardless of your event, that's for certain. 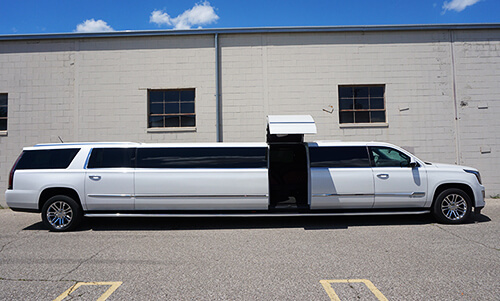 We're extremely proud of our growing fleet of limousines, limo vans, and limo buses in the Flint area. When it comes to transportation in Flint, there's truly no better way to enjoy yourself than by giving our company a call. You can look, but you aren't going to find better quality vehicles from another transportation company. Our fleet of limos is growing by the day. As you can see here, all of our vehicle selections are out of this world! Not only are they high quality, but they come polished for a fantastic appearance for your event. 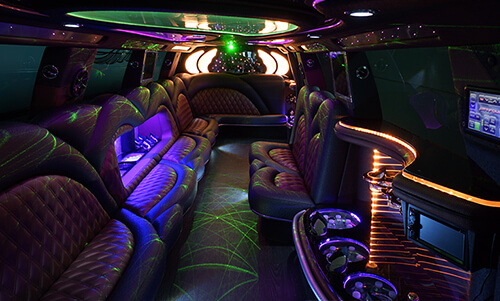 We offer anything from a Hummer H2 limousine to large 40 passenger buses that can fit you and all of your friends. Regardless of the event, you can trust that we'll be there on time and in style with a fantastic vehicle. We provide great limo service in the Flint area and in order to book it simply call 1-810-201-4794 and we'll be happy to assist you. We have customer service representatives who are on the phones right now to better service you. Just a normal transit van? Au contraire! 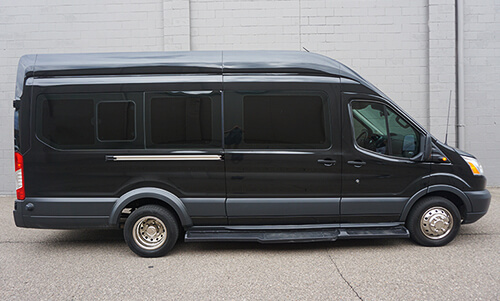 This van is packed with all of the standard features of a limousine only in compact form! This vehicle has awesome features. From high end sound to Bluetooth connectivity and more. You and your party will have a blast! 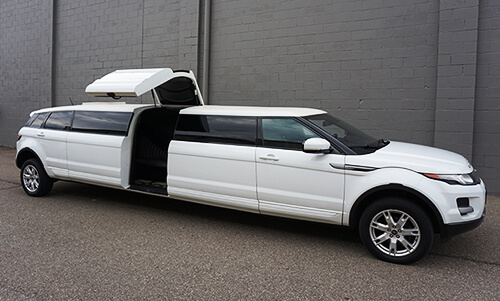 Our Range Rover features limo-style seating for 10-12 people. You'll love the colorfully lit floor and ceiling and the ample cooler space! Although the exterior looks like a standard van, when you and your guests get inside of this vehicle you're going to have a blast. 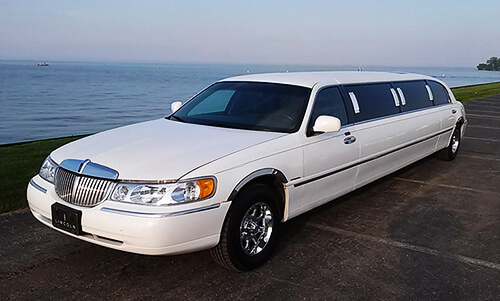 In the event that you're looking for an intimate and classic limousine experience, then this 8-12 passenger Town Car is the perfect vehicle for you. This vehicle features leather interior, awesome LED lighting throughout the vehicle, and beautifully accented flooring for men and women alike. This limousine looks small but packs a punch. 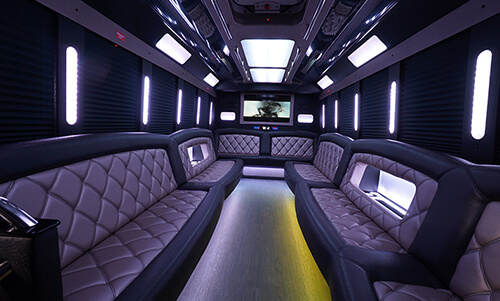 When you step aboard this 18-20 passenger limousine with your closest friends, you will have fun. 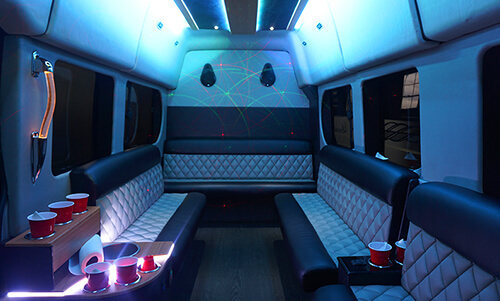 Our Escalade Limo features U shaped seating, laser and strobe lights, a television, and just about any other feature that you could imagine. 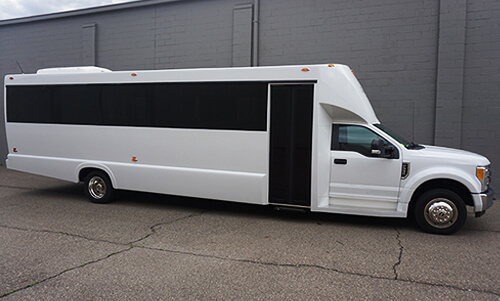 This party bus can fit 28 people and is surely a classy ride. Within the time you step on to the time you get off this vehicle you'll have a great time. 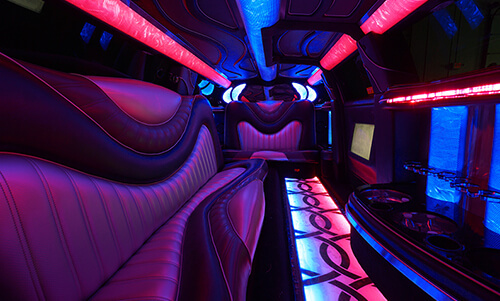 Our 20-28 passenger limo has dark tinted windows and spacious dance floor that ensures you'll have a great night. Call to book today! This is our 28-30 passenger limousine. It features an extremely high end sound system that is sure to bump all night long. 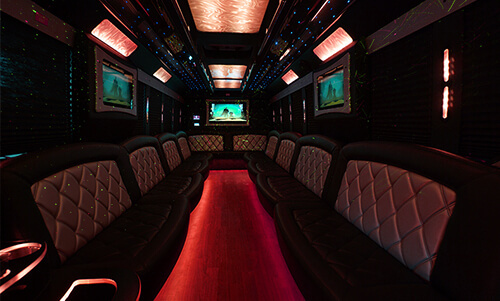 Our 28-30 passenger party bus features wrap around style leather seating, awesome lighting, and multiple televisions. 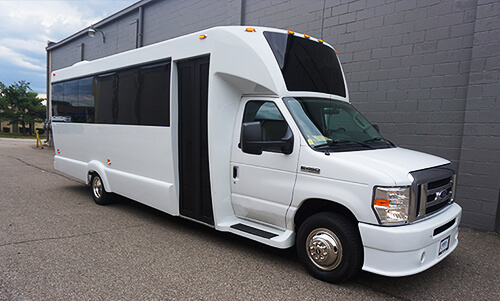 Our 34 passenger party bus can seat 34 people but, but the odds that you'll be sitting are slim to none! If you're into having a great time and and dancing the night away this is for you. 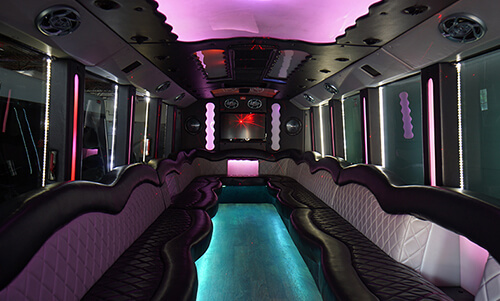 Our 34 passenger party bus features hard wood floors, gorgeous LED lighting throughout which only add to the awesome time that you'll have on the night of your event. 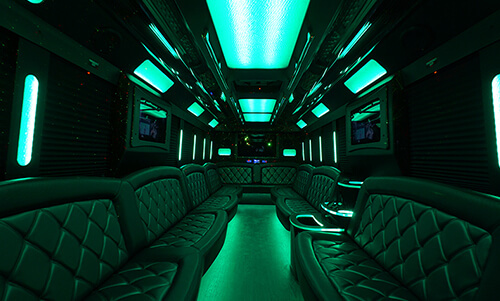 All of our limos, including our 20-35 passenger party buses feature high end sound systems, and awesome mood lighting. You're in for a real treat when you choose this vehicle. 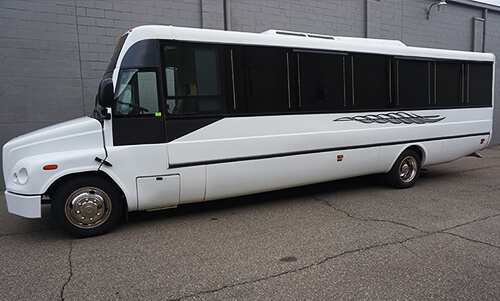 We've got quite a few 20-35 passenger limos and buses. This is an example of one of them. As you can see, it features hard wood flooring throughout, multiple TVs, and more. 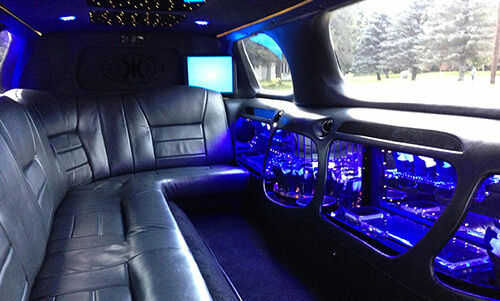 Limos Flint is in the business of providing luxury limos to all of Genesse, Saginaw, Lapeer, and Oakland Counties. 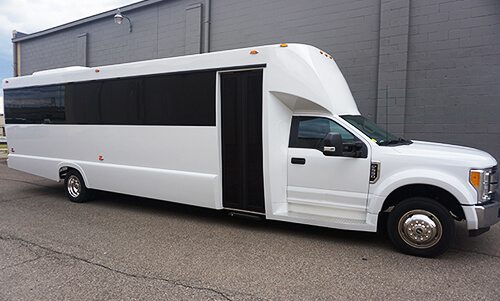 We have an open door policy so if you're shopping around and you'd like to see a limo or party bus that has caught your eye then give us a call and schedule a time today! In the event that it is after hours or if you cannot make it in time, we'll be more than happy to schedule a time during normal business hours and you'll be able see any vehicle you choose.